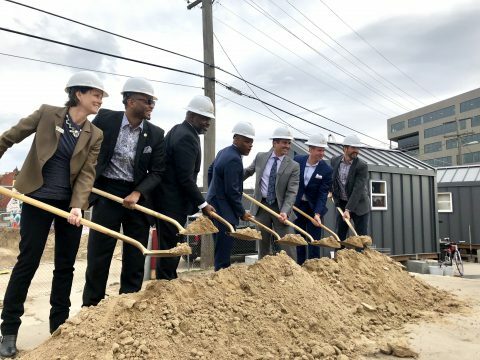 On Thursday afternoon, Urban Land Conservancy (ULC) and Medici Consulting Group (MCG) broke ground on the Walnut Street Lofts – 66 units of permanently affordable housing in the Cole neighborhood of Denver. The groundbreaking was a momentous occasion for a neighborhood experiencing rapid displacement. The transit oriented development, located directly adjacent to the Blake commuter rail station, will provide households earning 30%-60% Area Median Income (AMI) the opportunity to rent affordable one, two and three bedroom units. ULC acquired the site in November 2011 using Denver’s Transit Oriented Development (TOD) Fund for the future development of affordable housing. In 2017, MCG was awarded low income housing tax credits (LIHTC) from Colorado Housing and Finance Authority (CHFA). Thanks in part to the tax credits, years of collaboration and the foresight of ULC to purchase the land when prices were low, 66 units of affordable housing will be available along the 38th and Walnut side of the property. In addition, the property will join ULC’s growing community land trust (CLT) through the implementation of a 99 year renewable ground lease agreement to ensure the property remains affordable in perpetuity. From left: Alison George (DOH), Councilman Albus Brooks, Mark Marshall (ULC), Mayor Michael B. Hancock, Jaime Gomez (CHFA), Scott Horton (Wells Fargo) and Josh Russell (MCG). Denver Mayor Michael B. Hancock, a keynote speaker at the groundbreaking, emphasized the importance of permanent affordability. “It’s about the fact that this building will be standing, when we’re all long and gone, and our great-great grandchildren will wonder who the people behind this affordable housing were,” said Mayor Hancock. 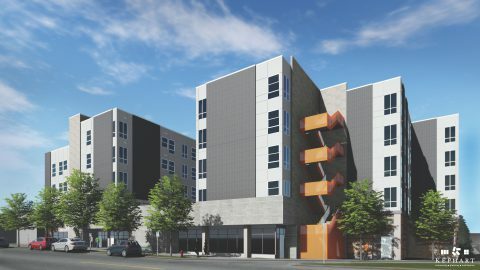 Mayor Hancock was also quick to applaud the project for its inclusion of affordable three-bedroom apartments, which are in short supply across the metro region. Lastly, Mayor Hancock highlighted his administration’s dedication to increasing affordability in Denver. In 2018, the City invested $50 million towards the preservation and development of affordable housing, and have announced a commitment of $60 million for 2019. This investment is a powerful statement by the City of Denver, and will go a long way towards preserving and creating critical affordability throughout the city. Mark Marshall, ULC’s Director of Real Estate, provided remarks on behalf of the nonprofit real estate organization. Marshall highlighted the importance of foresight in making affordable housing developments a reality. When the property was acquired in 2011, the average cost per square foot was roughly $25/square foot. This number has seen skyrocketed to more than $200 per square foot, making any affordable development nearly impossible with this prohibitively high cost of land. Additional speakers during the event included Josh Russell of Medici Consulting Group, Councilman Albus Brooks, Jaime Gomez of the Colorado Housing and Finance Authority (CHFA), Scott Horton of Wells Fargo, Alison George of the Division of Housing (DOH) and Tom Gougeon, one of ULC’s Founding Board Members. Gougeon played a critical role in ULC’s inception in 2003, and has remained invested in our work for more than 15 years. During the groundbreaking, he spoke on the power of land banking for future community benefit, especially along major transit corridors. In addition, ULC would be remiss not to mention our very own Senior Vice President of Real Estate, Debra Bustos for taking the initiative in 2011 to purchase the property for just $1.7 million. Displacement is a crucial issue in the Five Points neighborhood as property values continue to rise. “There are a lot of families that are getting displaced, as a result of all the development that’s coming up from the RiNo area… and it was important for us to provide family units,” said Bustos in an interview with Denver7 News. ULC would like to thank our many partners that played a major role in making this dream of affordable housing in the Cole neighborhood a reality: Medici Consulting Group, KEPHART, CHFA, Wells Fargo, BC Builders, the Denver Housing Authority (DHA), the Colorado Division of Housing (DOH), Denver’s Office of Economic Development (DEDO), the City and County of Denver, and many more. ULC is thrilled to bring permanent affordable housing to a neighborhood with such critical need.